A magical southern city just an hour east of Atlanta, Madison is the town Sherman refused to burn on his infamous March to the Sea. Its National Register Historic District is one of the state’s largest collection of 19th century architecture, earning it a place on Budget Travel’s 2012 “16 Most Picturesque Villages in the World” and Travel Holiday’s 2001 “#1 Small Town in America.” Madison combines with nearby Rutledge to house more than 170 antiques dealers, 40 boutiques and 20 unique eateries. It was also listed by Where to Retire Magazine as one of "8 Great Towns to Retire" in the US. Aristocratic from its 1807 founding, Madison keeps its cultural edge with offerings from the visual and performing arts to epicurean delights served in an array of venues, whether very fine dining or riverside outings at area farms. Art, food, music and agricultural festivals abound throughout the year. Madison is perfectly situated for exploring several of Georgia’s top regional highlights: Georgia’s Antebellum Trail, a 100-mile trek through seven communities that escaped the Civil War; Georgia’s Antiques Trail, offering delightful shopping in 18 beautiful communities; Georgia’s Lake Country, a honey hole of exceptional entertainment, values and adventures in the historic towns and private retreats surrounding Lakes Oconee and Sinclair; Heartland of the Confederacy Trails, combining the drama of Civil War battles and the lives of the people who lived in the state which, outside of Virginia, witnessed more military action than any other; Georgia’s Heritage Highway 441, winding its way from Georgia’s mountains to the coastal plains; Georgia’s Historic Heartland, a feast for the senses with a heaping helping of southern hospitality, shopping, fishing, scenic byways and festivals, and Treasures Along I-20, a plethora of finds along 60 miles of Interstate between Conyers, Covington, Social Circle, Rutledge, Madison, Lake Oconee and Greensboro. 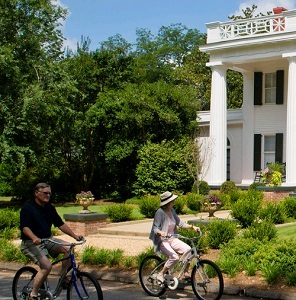 Madison hosts Georgia’s two largest annual historic home tours each Christmas and May. Open daily for touring, there are three antebellum house museums, an African American museum and the Madison-Morgan Cultural Center.The 1895 Romanesque revival Madison-Morgan Cultural Center was built as one of the South’s first graded public schools (famous comedian Oliver Hardy attended here, and now serves as the focal arts center for the community. Jan 31.6 F° 42.0 F° 52.3 F° 5.2 "
Feb 33.9 F° 45.6 F° 57.4 F° 4.5 "
Mar 40.8 F° 53.0 F° 65.3 F° 5.3 "
Apr 47.6 F° 60.7 F° 73.8 F° 3.6 "
May 56.7 F° 69.0 F° 81.4 F° 4.0 "
Jun 64.7 F° 76.4 F° 88.1 F° 3.9 "
Jul 68.7 F° 79.9 F° 91.1 F° 4.1 "
Aug 67.7 F° 78.5 F° 89.4 F° 4.0 "
Sep 61.7 F° 72.7 F° 83.7 F° 4.1 "
Oct 49.9 F° 62.1 F° 74.4 F° 3.2 "
Nov 41.5 F° 53.0 F° 64.6 F° 4.1 "
Dec 34.0 F° 44.6 F° 55.2 F° 4.0 "
Spring temperatures are cool with averages in the low 60's and highs in the low 70's. Nights are cold with lows in the upper 40's. Summer temperatures are warm with averages in the upper 70's and highs in the upper 80's. Nights are mild with lows in the upper 60's. Fall temperatures are cool with averages in the low 60's and highs in the mid 70's. Nights are cool with lows in the low 50's. Winter temperatures are cold with averages in the mid 40's and highs in the mid 50's. Nights are cold with lows in the low 30's.